When I was a little girl, Grams always played with my curls. That was the best feeling in the world for a five year old. When I was older, I loved to stay at Grandma's house because she let me wear a pony tail to school. Mama always made me wear ringlets. A pile of power poles lay in a scramble at the ranch, up the hill from the barn. As soon as we received a phone call that Grams and Papa were on their way to visit, I ran out to the pile of poles to be the first to see them arrive. I walked back and forth on one pole and then another, like balance beams, until they left the highway and stopped to pick me up. When Papa's truck stopped, I jumped onto the running board and Grams held onto me through the window as we drove down to the house. When Papa worked for Simplot Sand Mine, Grams and Papa lived in a boxcar. I imagine it rolling along between high stands of sunflowers and fields of corn, through sun-baked, wind-blown deserts, and across the bridges of America, swaying, creaking, and groaning, before it arrived at the sand mine and my grandparents made it a home. It was tan without graffiti adornment and a flight of rough, wooden steps led up to both the kitchen and living room doors. Grams hollyhocks were higher than the sky. My patent-leather-best clicked up Grandma's steps in a special hollow way, and the anticipation of her open arms was overwhelming after climbing the drumming, wooden stairs. Grams' house smelled better than any other house I have ever known. It was an intoxicating mixture of the steamy aroma of coffee, bacon, beans cooking and biscuits made from scratch, with a hint of Grams home-rolled tobacco. As good as it smelled I never spent much time at the table. I loved to play in the arrow weeds that grew in a small stand nearby. I don't know if I was drawn to them because of the stories that Indians made their arrow shafts from them, or the way they grew slender and tall, a veritable forest towering over me and hiding me from prying eyes at ten, or the way they smelled of water before a rain. They were a gray-green mystery. Wednesday evenings, Papa always watched the boxing match on black and white television. My two younger brothers and I hounded him to death about when the boxing match ended so we could watch "Popeye" or "Superman." He was the most patient man I ever knew. He just laughed in that Papa-way, sucking his breath in instead of laughing out, but he didn’t give up his boxing. The boxcar was enchanting and enchanted. It was quite high off the ground and underneath was a small box of rocks. The Gentry's were always interested in prospecting. I knew some of the rocks were copper and turquoise, but some of them were bright yellow and very tempting to touch. I had strict orders not to touch those particular rocks. But though I wanted to play with them and carry them in my pockets where no one would know, I never did. Later, I discovered the attractive yellow rocks were radioactive uranium and handling them could have been detrimental to my health. I didn't always obey. When a nearby house burned down, I combed through the rubble and found probably every piece of melted glass in the ruin, even after being told not to go near it. At the boxcar, I rode on somebody's shoulders and fell off backwards. I had the wind knocked out of me and thought I was going to die before I caught my breath. Grams closet was a magical place. From her closet, she produced a soft, white bag full of elbow-length net gloves of every color of the rainbow. I spent hours playing with those gloves. In fact, from her closet, we could dig out all kinds of artifacts of the fashionable past. A beautiful black-net dress hung in front where I lingered on it every time the closet opened. I wanted that dress when I was little, but when I grew to be a teenager and Grams offered it to me, I'm afraid I hurt her feelings when I told her I didn't want it anymore. She had saved it for me all those years in faith. "Hopefully not for a long time," she said. I recently figured she would have been between 47 and 50. Whenever I wanted something I couldn't have, Grams said, "Someday, darling, someday." It intimated that someday we would have more money, someday it would be a priority, someday, I would have anything I wanted, someday. And I echoed, "Someday, Grandma, someday." That became our motto. Whenever we had a disappointment or failure, one of us said, "Someday, someday." Not many years ago, Rebeca, my nephew's daughter, asked me, "When are you going to die? Who will get your things?" "You, I guess," I said. "What do you want?" What goes around comes around they say, whoever they are. But I suspect, when Rebeca finally inherits those marvelous things she can't live without, she won't think they are all that "cool" anymore. We should just give them the things they want when they can mine the most pleasure from them. What does that really say about life? It's a revelation to realize material things don't retain their value with time, making it so important to remember and pass on the stories of people we love. Grams was a soft-spoken woman and considered herself very ordinary, but she was extraordinary to me. I always felt I was her favorite person in the world, and I believe if I asked my brothers, they would say they were her favorites. She had a way of making everyone feel special. It wasn't just the boxcar that was enchanted. 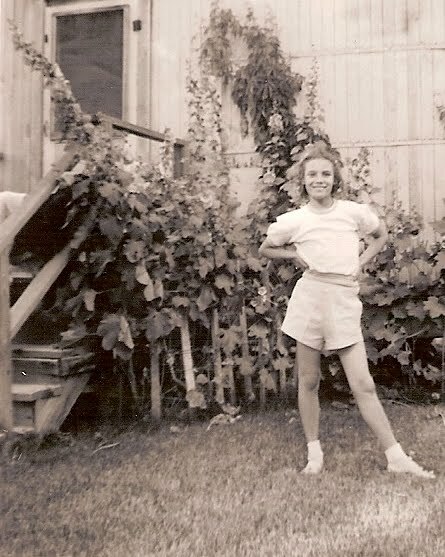 Every place Grams lived after I knew her was enchanting from the corner shelves holding the Polynesian drummer and dancer and brass horses, to the irises in her planters and the strawberries in her garden. I suspect Grams knew something about magic, and a lot about love.